Bowmore is Islay’s oldest distillery, and home to the world’s oldest whisky maturation warehouse, the No. 1 Vaults. It’s in this legendary warehouse that Bowmore whisky has been meticulously matured by Master Distillers for nearly 240 years. Bowmore’s founder, the merchant David Simpson, bought the land in 1766. The first recorded mention of the Bowmore Distillery dates from 1779, but a few of the older islanders say that distilling started some time before that. When it comes to whisky heritage, Bowmore Distillery is unrivalled, with the traditions, skills and expertise that were crafted in the earliest days of Scotch whisky being handed down through each generation. The magical character of Islay and centuries of tradition patiently combine to create a whisky that stands out for its balance, complexity and beauty. Bowmore single malt Scotch whisky is created using just three ingredients: barley, yeast and water. Fresh water is drawn from the nearby River Laggan, barley is grown and malted on the island, and the yeast is painstakingly cultivated. The distillery team expertly prepare the ingredients and distill the spirit through a complex and time-worn process. 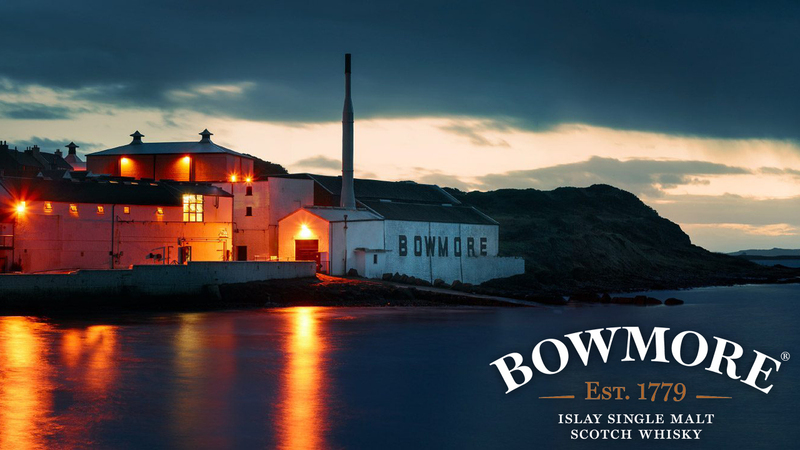 However, it’s at the maturation stage, arguably the most important part in Bowmores' whisky journey, that the “new make spirit” develops its complex array of flavours and becomes what we know as Bowmore single malt Scotch whisky. Single malt Scotch whisky is too delicate to mature in new oak casks, so a variety of used casks to develop the different colours and flavours of the whisky are carefully sourced from across the world. Legally, new make spirit only becomes whisky after it has been matured for three years. At Bowmore, whiskies are matured for a minimum of nine years. During that time, casks rest patiently, painstakingly stacked in the maturation warehouses, the most famous of which is the No.1 Vaults. The legendary No. 1 Vaults is an old stone warehouse that sits on the edge of Loch Indaal. Each cask gradually absorbs the gentle Islay sea air allowing the spirit within to interact with the wood and absorb the unique characteristics of the cask, the atmosphere of the No.1 Vaults and of course Islay itself. Ex-American Oak Bourbon barrels are most commonly used to create the light golden liquid and sweet vanilla flavours that Bowmore Scotch whisky is renowned for. However, ex-Spanish Sherry casks are also used on some bottlings imbuing their own unique character into the spirit. These casks create more dramatic aromas and notes, giving a deep amber colour and flavours of dried fruits. With years of training and generations of experience to draw upon, the Master Blender knows exactly how every cask is maturing at any given time and is only drawn upon when the whiskey within is of the highest quality.